We leave Launceston on our journey eastward and south toward Swansea, next to the Freycinet Peninsula. Swansea will be our “home base” for exploring some of the shoreline of this northeastern part of Tasmania. Marlborough House is now occupied as a private residence. This picture would have been much more appealing if I hadn’t parked our rental car directly in front of it. Back on the right route, we pass through Campbell Town not too long after. Here is another larger 19th century township that we decline to explore, except to stop and take a closer look at the carvings we see in a park right by the bridge. These were carved out of the stumps of trees. The one with the soldier guarding the convict as he worked is a good representation of this island’s history. Tasmania is know for its beautiful, rare, and unique hardwood (and also some softwood) timber, which is a carefully regulated industry. Therefore, the best souvenir that you can take from Tasmania is something made from one of the specialty woods – in particular, Huon Pine, Black Heart Sassafras, Blackwood, and Myrtle, among others. The most famous and prized of Tasmania’s timbers is the Huon Pine. It is Australia’s oldest living tree and one of the oldest known living organisms on the planet. Its durability is due to the presence of a unique oil, methyl euganol, which permeates the wood, making it virtually impervious to rot and giving the timber a distinctive smell. To this day it remains the preferred wooden boat building timber due to its durability and ease of use. Is there a Huon Pine that is over 10,500 years old in Tasmania? An interesting story about this “Methuselah” tree can be found here. We couldn’t resist the lure of these artisan products and over the next few days, ended up purchasing several Huon Pine cutting boards, and some other items, including a French style rolling pin and a cheese knife. We set out to drive northward up the East Coast for a day of exploring – destination Bay of Fires – so named because of the red lichen deposits on the rocks. Bicheno is our first stop, and what a delightful surprise. Already we find the red rocks that we thought we would only see further north at the Bay of Fires. Bicheno is also known for the Bicheno Blowhole, an opening in the rocks through which water sprays as the wave hit the rocky shoreline. Bicheno is also home to penguins, which come to shore each night at dusk to bed down for the night. We very much wanted to see this, however, it would have entailed a somewhat long drive back late at night on twisting roads, so we decided against it. We stop for a seafood lunch at St. Helens, a pretty fishing village located on the shores of Georges Bay inlet and a base for serious game fishing. We have a lovely lunch at the the Blue Shed, dining on very well prepared and fresh fish while gazing out the large glass windows. East shoreline views. We took this picture because we admired this home owner’s views. You have to like it just for its name – and its white sand beaches. We have seen many beautiful sights as we have traveled up the eastern coastline. Finally we arrive at Bay of Fires and it does not disappoint. While there is no formal place to pull over and park, we realize that one must find a flat area in the grass. The miles of shoreline are colorful with red lichen covered rocks, even some green and yellow too. Set against deep aqua sea, and white sand beaches, this is a magical place. As we explore we discover that the while the seaweed is not blue, it adds a deep blue tinge to the water from a distance. As we explore we discover that the water is crystal clear, so we find a spot where we can lean against the rocks and soak our feet in the cool water while soaking up the sun reflecting off of the rounded rocks. Ed finds a pool at Bay of Fires. We will stay here a while. It almost seems mandatory that while in the area, that one explores the Freycinet Peninsula, with its scenic beaches, pink granite boulders, and magnificent outlooks. The most well known of these is the hike to the lookout to Wineglass Bay. Certainly it is a pretty outlook, especially on a sunny day when the water is deep aqua blue and rimmed with a white sand beach. In reality, the hike is deceptively steep. If one wanted to continue, they can proceed downhill to the beach. The total hiking time is 2 hours (not including the return). We didn’t do this. The uphill hike to the lookout was enough. Looking up on the approach to the Wineglass Bay lookout. Do you mean that we have to go all the way up there? Wineglass Bay Hike – Ed still looks fresh. We finally reach the top and here is the grand view of Wineglass Bay. Well, that was a great view, but I am exhausted and it is a long way back down. So long, in fact, that we begin to question whether we have taken a wrong turn somewhere. The descent is another trail and we see very few people. We do, however, finally make it back to the parking lot and get a chance to get close to this Wallaby, who is not bothered by people at all. It has been a “rocky” adventure – and now for some refreshment. Considering the somewhat dry countryside, it surprised us that there were a few good vineyards here. I suppose that irrigation is the key. 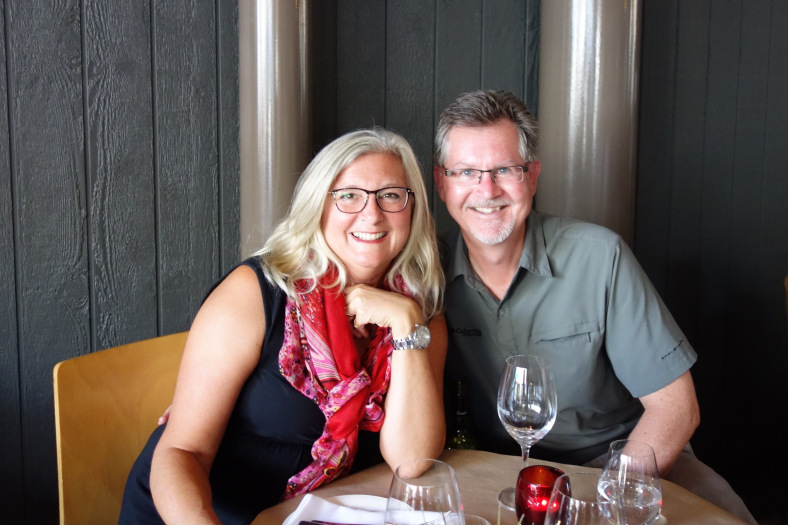 We stopped by Devils Corner,drove by Freycinet, and ate a very delicious meal at Springvale Vineyards, which was served outdoors in open air tents. A final look at some rocks which were used to build a bridge, called Spiky Bridge. This bridge, like most bridges here, were built using convict labor. Lots of rocks plus lots of convicts makes bridges, I guess. We have greatly enjoyed our time here in this region of Tasmania. Tomorrow we head toward Hobart. This entry was posted in Tasmania and tagged avoca, bay of fires, bicheno, bicheno blowhole, binalong bay, blue shed restaurant, campbell town tasmania, convict trail, freycinet peninsula, honeymoon bay, huon pine, marlborough house in avoca, penguins, pink granite, red lichen rocks, redcliffe house, spiky bridge, springvale vineyards, st. helens, st. thomas anglican church in avoca, swansea, tasmanian timber industry, Wallaby, wineglass bay lookout. Bookmark the permalink. Hi Val – no I didn’t remember that store. Was that the one with the knitted goods? Anyway, thanks for the trip down memory lane. Awesome! It was at Powerscourt gardens I believe – I think we got pastries and something to drink at the outdoor court. I got my lovely pink cashmere scarf there and think of it every time I wear it. Keep the adventures coming! I love it!